1 A None No Power Seat 1 A may have restricted legroom and the close proximity to the galleys may be bothersome. There is no floor storage for this seat during take-off and landing. 1 B None No Power Seat 1 B may have restricted legroom and the close proximity to the galleys may be bothersome. There is no floor storage for this seat during take-off and landing. 1 E None No Power Seat 1 E may have restricted legroom and the close proximity to the galleys may be bothersome. There is no floor storage for this seat during take-off and landing. 1 F None No Power Seat 1 F may have restricted legroom and the close proximity to the galleys may be bothersome. There is no floor storage for this seat during take-off and landing. 11 A None No Power Seat 11 A is an Economy Plus seat, however there is no window at this seat. 12 A None No Power Seat 12 A is an Economy Plus seat that is missing a window. 12 F None No Power Seat 12 F is an Economy Plus seat that is missing a window. 15 A None No Power Seat 15 A is a standard Economy Plus seat that does not recline due to the Exit Row behind. 15 B None No Power Seat 15 B is a standard Economy Plus seat that does not recline due to the Exit Row behind. 15 C None No Power Seat 15 C is a standard Economy Plus seat that does not recline due to the Exit Row behind. 15 D None No Power Seat 15 D is a standard Economy Plus seat that does not recline due to the Exit Row behind. 15 E None No Power Seat 15 E is a standard Economy Plus seat that does not recline due to the Exit Row behind. 15 F None No Power Seat 15 F is a standard Economy Plus seat that does not recline due to the Exit Row behind. 20 A None No Power Seat 20 A is an Economy Plus seat with extra legroom due to the Exit Row in front, but also has limited or no recline due to the Exit Row in back. This seat is missing a window-side armrest which may be bothersome. 20 B None No Power Seat 20 B is an Economy Plus seat with extra legroom due to the Exit Row in front, but also has limited or no recline due to the Exit Row in back. 20 C None No Power Seat 20 C is an Economy Plus seat with extra legroom due to the Exit Row in front, but also has limited or no recline due to the Exit Row in back. 20 D None No Power Seat 20 D is an Economy Plus seat with extra legroom due to the Exit Row in front, but also has limited or no recline due to the Exit Row in back. 20 E None No Power Seat 20 E is an Economy Plus seat with extra legroom due to the Exit Row in front, but also has limited or no recline due to the Exit Row in back. 20 F None No Power Seat 20 F is an Economy Plus seat with extra legroom due to the Exit Row in front, but also has limited or no recline due to the Exit Row in back. This seat is missing a window-side armrest which may be bothersome. 21 A None No Power Seat 21 A is an Economy Plus seat that has extra legroom due to the Exit Row in front, however this seat has a short armrest attached to the exit door which may be bothersome. 21 B None No Power Seat 21 B is an Economy Plus seat that has extra legroom due to the Exit Row in front. 21 C None No Power Seat 21 C is an Economy Plus seat that has extra legroom due to the Exit Row in front. 21 D None No Power Seat 21 D is an Economy Plus seat that has extra legroom due to the Exit Row in front. 21 E None No Power Seat 21 E is an Economy Plus seat that has extra legroom due to the Exit Row in front. 21 F None No Power Seat 21 F is an Economy Plus seat that has extra legroom due to the Exit Row in front, however this seat has a short armrest attached to the exit door which may be bothersome. 30 A None No Power Seat 30 A is a standard Economy Class seat with a misaligned window. 30 F None No Power Seat 30 F is a standard Economy Class seat with a misaligned window. 31 A None No Power Seat 31 A is a standard Economy Class seat that is missing a window. 31 D None No Power Seat 31 D is a standard Economy Class seat that is missing a window. 37 A None No Power Seat 37 A has reduced seat width by 1" due to the curvature at the tail of the plane. The proximity to the lavatories and galleys may also be bothersome. 37 B None No Power Seat 37 B has reduced seat width by 1" due to the curvature at the tail of the plane. The proximity to the lavatories and galleys may also be bothersome. 37 C None No Power Seat 37 C has reduced seat width by 1" due to the curvature at the tail of the plane. The proximity to the lavatories and galleys may also be bothersome. 37 D None No Power Seat 37 D has reduced seat width by 1" due to the curvature at the tail of the plane. The proximity to the lavatories and galleys may also be bothersome. 37 E None No Power Seat 37 E has reduced seat width by 1" due to the curvature at the tail of the plane. The proximity to the lavatories and galleys may also be bothersome. 37 F None No Power Seat 37 F has reduced seat width by 1" due to the curvature at the tail of the plane. The proximity to the lavatories and galleys may also be bothersome. 38 A None No Power Seat 38 A is in the last row of the plane and has limited recline. This seat has reduced seat width by 1" due to the curvature at the tail of the plane. The close proximity to the lavatories and galleys may also be bothersome. 38 B None No Power Seat 38 B is in the last row of the plane and has limited recline. This seat has reduced seat width by 1" due to the curvature at the tail of the plane. The close proximity to the lavatories and galleys may also be bothersome. 38 C None No Power Seat 38 C is in the last row of the plane and has limited recline. This seat has reduced seat width by 1" due to the curvature at the tail of the plane. The close proximity to the lavatories and galleys may also be bothersome. 38 D None No Power Seat 38 D is in the last row of the plane and has limited recline. This seat has reduced seat width by 1" due to the curvature at the tail of the plane. The close proximity to the lavatories and galleys may also be bothersome. 38 E None No Power Seat 38 E is in the last row of the plane and has limited recline. This seat has reduced seat width by 1" due to the curvature at the tail of the plane. The close proximity to the lavatories and galleys may also be bothersome. 38 F None No Power Seat 38 F is in the last row of the plane and has limited recline. This seat has reduced seat width by 1" due to the curvature at the tail of the plane. The close proximity to the lavatories and galleys may also be bothersome. 5 A None No Power Seat 5 A is a First Class seat that does not recline and the close proximity to the lavatory behind may be bothersome. 5 B None No Power Seat 5 B is a First Class seat that does not recline and the close proximity to the lavatory behind may be bothersome. 5 E None No Power Seat 5 E is a First Class seat that has limited recline, 2/3 that of the standard First Class recline. The close proximity to the lavatory may be bothersome. 5 F None No Power Seat 5 F is a First Class seat that has limited recline, 2/3 that of the standard First Class recline. 7 D None No Power Seat 7 D may have some extra legroom, however the close proximity to the lavatory may be bothersome. The tray table is in the armrest, making the armrest immovable and slightly reducing seat width. 7 E None No Power Seat 7 E may have some extra legroom, however the close proximity to the lavatory may be bothersome. The tray table is in the armrest, making the armrest immovable and slightly reducing seat width. 7 F None No Power Seat 7 F may have some extra legroom, however the close proximity to the lavatory may be bothersome. The tray table is in the armrest, making the armrest immovable and slightly reducing seat width. 8 A None No Power Seat 8 A is an Economy Plus Bulkhead seat, however legroom may be restricted. The close proximity to the lavatory may be bothersome. The tray table is in the armrest, making the armrest immovable and slightly reducing seat width. There is no floor storage for this seat during take-off and landing. 8 B None No Power Seat 8 B is an Economy Plus Bulkhead seat, however legroom may be restricted. The close proximity to the lavatory may be bothersome. The tray table is in the armrest, making the armrest immovable and slightly reducing seat width. There is no floor storage for this seat during take-off and landing. 8 C None No Power Seat 8 C is an Economy Plus Bulkhead seat, however legroom may be restricted. The close proximity to the lavatory may be bothersome. The tray table is in the armrest, making the armrest immovable and slightly reducing seat width. There is no floor storage for this seat during take-off and landing. 9 A None No Power Seat 9 A is an Economy Plus seat that has a misaligned window. In all classes of this aircraft, there is a wide array of audio entertainment. 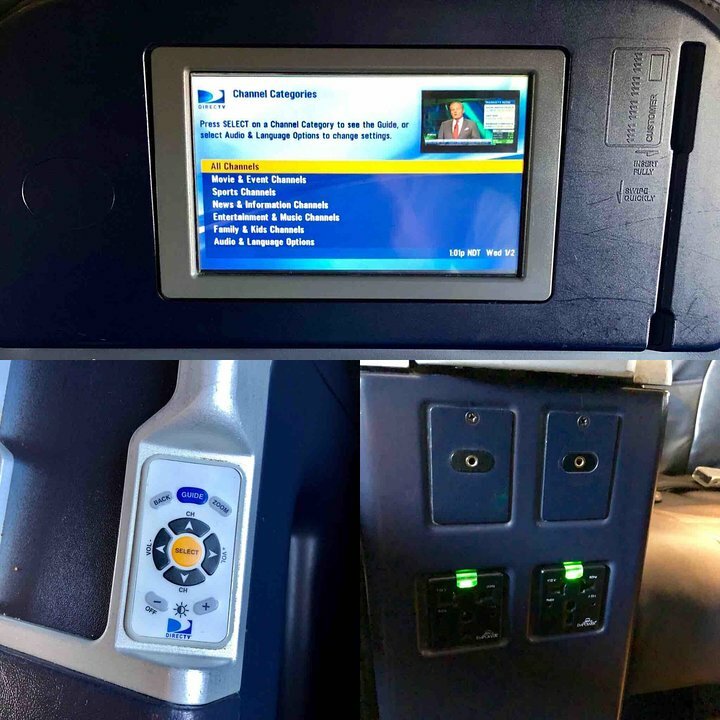 On most of the 737-900s in United's fleet all classes are equipped with Audio Video On Demand (AVOD) with DIRECTV. United is still in the process of outfitting their entire 737-900 fleet with DIRECTV. Version 1 is an extended range aircraft that seats a total of 167 passengers and has a configuration of 20 First Class seats, 51 Economy Plus seats, and 96 Economy Class seats. This aircraft serves routes within North America. This version is equipped with personal Audio Video On Demand (AVOD) with DIRECTV. There is another version of this aircraft that operates with wireless entertainment. Version 2 is a non-extended range aircraft that also seats a total of 167 passengers and also has a configuration of 20 First Class seats, 51 Economy Plus seats, and 96 Economy Class seats. Again, This version is equipped with personal Audio Video On Demand (AVOD) with DIRECTV. Version 2 however, features power ports in all First Class seats and between seats in rows 7-21 in Economy, rows 22-38 are not equipped with power unike Version 1. Additionally, Version 2 has a seat width of 17.2" rather than 17.3". The aisle seats in this aircraft have restricted floor storage due to the design of the seats. Passengers have reported that a large support structure splits the underseat storage in half. Consequently, only small items (purses, small computer bags) will fit under the aisle seats. MY FEET WERE FREEZING! Pack socks! Seat 12F is not ecomony plus. it's a shorter length seat than even regular coach. Horrible. The power receptacles were not in a handy place. Seats are tight, so if you are a heavier person bring a seat belt extender with you. 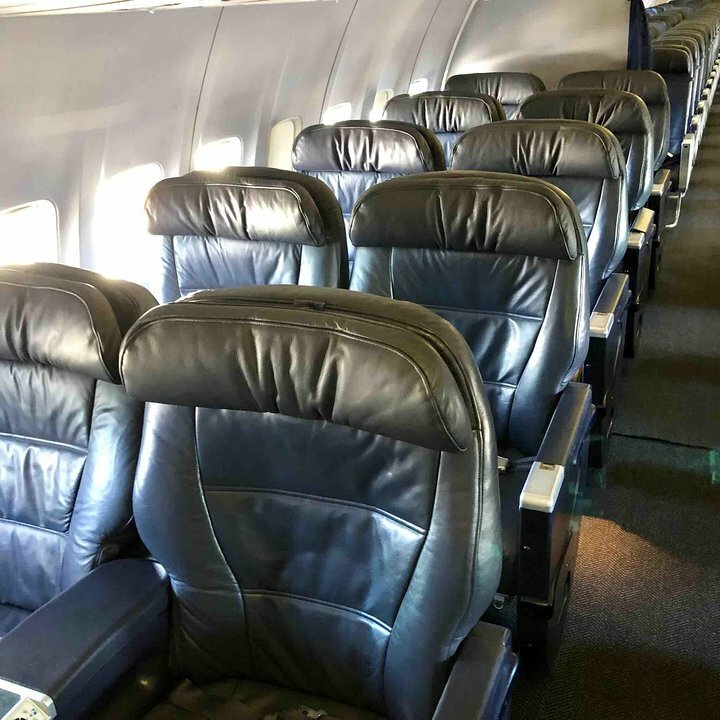 They have made row 14 (or looks like added it) and row 15 Economy Plus that you can upgrade to, which we did and it was a huge mistake because there is no leg room. You cant even bend over to get things out of your carryon. It's terrible. No window mean blank wall (WHY? ), except for the very small sliver of mis-aligned window from Row 10. Although we flew a night flight, I'd thought we'd have SOME window to view landing/take-off. I took a photo I'd like to submit. Legroom was good even for my 6'4" husband. Middle seat near the back. I'm 6'0" and on most other planes I have about an inch gap. Middle seats are "tolerable." This time I was forced to sit straight up and my knees still touched the back of the seat. Worst plane I've ridden in a long time. Clearly a United cattle shuttle. LAX-HNL First class? Yeh First class in the 1980s more like. To add insult to injury there is not even lounge access at LAX after a 12 hour flight from FRA! Service excellent however, food....not so excellent. If you have carry-on, be aware that you may not have any storage bin available. United will board you in either Group 3 or 4. By that time all the storage bins in the vicinity of Row 8 will probably be filled. And, you have no storage in front of you as it is a bulkhead. This window seat does recline but has no window! Flew in 3F from SFO to ORD. Leather seat with adequate legroom & width. Recline was OK for this 4 hour daytime flight. Would not want it for sleeping or very long flight. There were 2 lunch choices but they ran out of one by the time they got to me in row 3. Extra legroom due to bulkhead. Under seat storage in front because bulkhead does not go all the way to the floor. The restroom between first and economy is ridiculously small. I am 177 cm and 89 kg, and never thought of myself as being fat or otherwise "oversized", but I had a very hard time just figuring how to turn around in this restroom. Also, the recline in 5F is microscopic; I was on an upgrade coupon, and got what I was paying for, but if I had bought First Class, I would be shocked at the lack of comfort of those seats. Theres some kind of server infrastructure taking up the 28DEF half of the overhead bin - no room at all for bags. It also has very loud fans, so 28D is a poor choice if you want to get some sleep. Even though this seat is an economy plus seat it doesn't have much more leg room than standard economy seats. The close proximity to the lavatory may be bothersome since there will most likely be a line when the seatbelt sign is off. 737-900 no Eco plus seat configuration. Recline on seats on row 15 are restricted. First Class fare for this kind of seat, and the amenities provided, is a complete, giant RIP OFF. We flew a 757 out from SFO to NYC; that was truly luxurious first class, with nice over the ear headphones, great -- fantastic! -- food, and wonderful service. In the 737, you get Direct TV. Not on-demand, it is whatever is "on" at the time. Yes, you get commercials too. They give out crappy little earbuds that sound absolutely awful. The food was disgusting: a choice between a fish dish and a vegan dish!! What the heck is that? Butternut squash manicotti? Seriously? Disgusting! And, as far as the seat goes, you get good width, but the recline is barely a little more than a normal coach seat. There is no foot rest. Overall, not at all worth it! Save your money. 31E has no window or only partial window extending from row 32. Old plane with very uncomfortable seats even in business class (business price without comfort). No foot rest at all. Limited recline. No TV or direct TV service to personal device. The seat backs are so bad for storage...the pouch for personal items is almost on the floor. The net to hold things is unprivate mesh less than 12 inches deep....the underseat storage could hardly hold a purse....but United tookmpreciuos space below the tv screen for their promotional magazine etc. The window looks directly onto the wing. There is a second window over ypur left shoulder but that requires a real neck twist to see out. So choose a different seat for a view. Otherwise a pretty standard economy seat. Window post location allows for shoudler room, but NOT elbow on arm rest. This row has one power outlet between the isle and middle seats. None on the window seat. My boyfriend & I saw in 7E & 7D. There is more legroom here than in first class. He sat in the aisle and wasn't bothered by people entering or exiting the bathroom, but the stewardess would crash into him every time she passed by coming from first. Not sure why as the seat in first class sticks out and is even to where this seat sticks out into the aisle, but that is definitely a draw back. I sat in the middle and had no issues. The arm rests do not move. We had more legroom than we knew what to do with and he is 6'1. The separation wall doesn't extend to the floor, so you can put your purse, backpack, briefcase, etc. there and still have room. I will buy these seats again in the future if I don't buy into first. Seat 38F is not as a terrible seat as one would think. Sure, it's right by the lavatories but the Flight Attendants are right there for you and anything you need. Furthermore, it's one of the two only seats provide a view to the horizontal stabilizer which is pretty neat. Despite the fact that it also doesn't recline and it doesn't have the best legroom, seat 38F is just as good and provides a great exterior view as any other seat on the aircraft. Happy flying! Exit row seat against door. Very good leg room and the row in front can't recline so fairly good space, though seats are rather narrow (but not as bad as some other UAL flights). Seat cushion is thin but I was OK on my flight from ORD to SFO. Window is slightly forward so you have to lean forward to look out. This seat also with no recline; didn't bother me. Short arm rest built into exit door supported my elbow & part of arm. Rested my hand on tray & was OK.
Seat has plenty of legroom. Correctly aligned window. A little narrow in that not much room to use the armrest between 8F window seat and 8E middle seat. Across from bathroom and so you most likely will hve people coming/going to the bathroom all throughout flight. Good AC flow. I agree the "recliners" in First Class are impossible for a red-eye flight. Although, there is nothing I can do about it, the flight attendants' non-stop jabbering the entire flight just as annoying. Very roomy exit row seat, with a power outlet and a seatback TV for those who wish to pay for entertainment. Right armrest is part of the door so it's shorter, but that just gives you more room! Planes seems dated and is unkempt. Legroom is tight. No foot rest. Lights from galley make it impossible to sleep during overnight flight. Just miserably uncomfortable seats. United Economy Plus pitch on these planes is a meager 35" (only 31" in regular economy). I'm only 5'2", and felt cramped. It's not just this seat. It's all the Economy Plus seats. Flight from IAH-LAS seemed to be a cattle car heading for Las Vegas...cram as many people in as possible for a relatively long 2h 44m flight. Ugh! Sitting in first. Very disappointed. First class, international flight, and no TVs. Unheard of! I liked this seat and it actually had legroom because it was in Economy Plus. I was 13 and flying by myself from Orlando(MCO) to San Francisco (SFO)(8.9.16)(Flight 380).The flight attendants were really nice and I got free snacks and a free meal. When I got to the podium an hour before the flight departed, I was originally in seat 34F, but the flight was only half full and they moved me to Eco Plus for free. I like the United 737-900s, and the A319s. I flew LAX to IAH on United flight 1614 on 1/30/17. My seat was 14C which is an aisle seat. This was the 737-900. The seat map is accurate. I was surprised there was actually leg room in this seat. I am only 5'3", but the seat in front of me was a good 6" away. The seats do recline, but not a whole lot. There is no video display on the seats. United now has free wifi on this flight and they want you to download their app and watch the entertainment from the app. I ended up watching a movie on my iphone. Not ideal, but it was a movie to watch. The choices were very limited, most of the movies were pretty old; some TV series. The usual free coffee, tea & soft drinks, but a charge for snacks and other drinks. The United staff at the LAX airport are not friendly and because I was in boarding group 5 they made everyone gate check their bag. I wasn't real happy about it but they wouldn't let me board the plane unless I gave them my carry-on. The terminal is under construction in LA, and there is extremely limited seating and all the restaurants and few shops close at 10:00 PM. Be prepared! Overall I thought this plane was pretty comfortable. I didn't think the seats were uncomfortable, but I did bring two small pillows for my back so I didn't notice the hardness. I preferred this flight to my connecting flight which was on a 737-800. Those are awful! I did not pay extra for this seat, and would recommend this row and all rows in front of this! It is not a good seat beacause there is a person at left and a person at right. You are tight. 28 d through f has limited overhead storage space due to mechanical equipment mounted in the overhead storage. Sign says "No Storage"
Agree this seat has great legroom. The bulkhead wall does not extend all the way to the floor, allowing for storage under the back seat of the First Class row. Recommended over emergency exit seats. Bathroom door faces 7D but really no bother for me in 7F. Traveled w/ my two sisters. We're only about 5 ft tall, but these seats were a special kind of hell. They felt incredibly cramped and pretty much had no recline. I have avoided united since. If you can, just cancel your flight and spend the extra $100-200 and fly anyone else. My older sister refuses to fly again ever since traveling from phl to lax via united & this aircraft. Does not recline at all, my husband in seat 21D had same issue. This seat does recline unlike the map indicated. If you only have a small personal item, this will be an OK seat since you don't need overhead bin space. I did like the proximity to the bathroom. Overall United economy is like a bus, cramped and crowded, takes about 20+ minutes to de-plane. Flying tonight. Thanks for saving me the $126 I was planning to spend to upgrade to EconomyPlus or whatever it's called. The more expensive window seat (15F) I was looking at, I learned from your site, doesn't recline! Gracias! These seats are below average for first class seats. The pitch is average (38') - American has the best domestic first class pitch at 40/41'. This flight had DTV but it was in and out and it is disappointing that United has removed channel 9 (flight deck radio). Meal service in United First is awful - two choices, one cold & one hot option, both are equally bad. Air Canada hands down, has the best domestic/trans-border business class meal/beverage service in the market. While this is theoretically a window seat, the window is positioned next to your shoulder and therefore effectively unusable for adults. Seat pitch seems smaller than some regional jets but is theoretically identical. Seat width is actually narrower than regional jets that United actually operates. I'm a tall guy so I pay more for economy plus when flying with United. The seat I sat in had no extra leg room. It looked like seats A-C had increased leg room but my seat defiantly did not have extra leg space. Wasted $100. Tightest pitch I have ever experienced in a 737. Seemed even tighter than 31". When the seat in front reclined, it was in my lap. Next time I'll take Southwest. 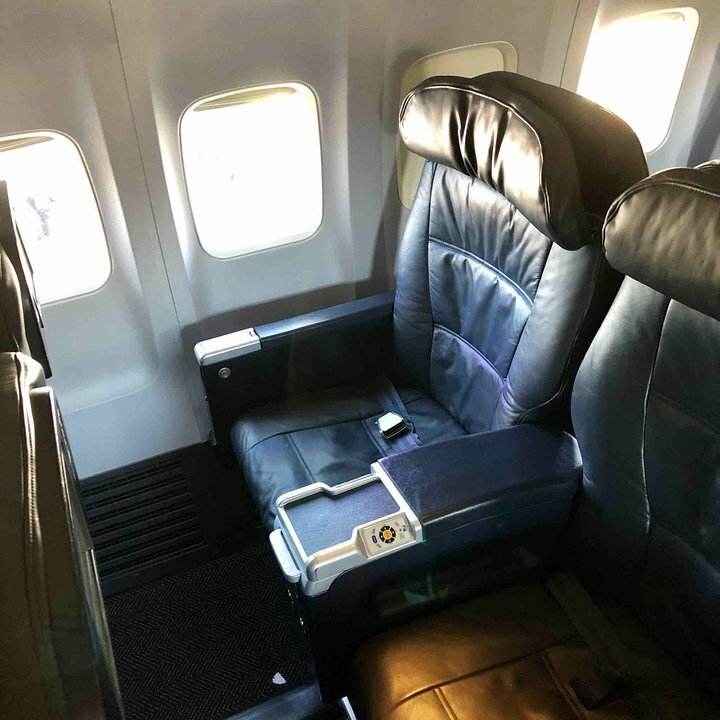 The seat has the best legroom on Economy Plus area... enough area to extend your legs, as the bulk head wall do not extend all the way to the floor, it allows to storage under the last seat of the First Class row. Very comfortable seat...strongly recommended over emergency exit seats. United first class is not worth any added expense. This seat has literally no recline and is right in front of the bathroom. This didn't stop the flight attendant from waking me to tell me to make sure my seat was in the upright and locked position. When awake I listened to constant banging from the lavatory door and could hear the faucet and flushing noises. The "first class meal" consisted of a luke warm scone the size of a small cookie. They came through once with a beverage service, otherwise you had to use your call light. The seat was also hard and uncomfortable and the leg room was no more that regular economy. United first class is not worth the price. The first class seats are the most uncomfortable of any aircraft in the fleet. They are too close together - same legroom as economy plus, and barely recline. Do not even consider sleeping in these seats. On the EWR - SAN route (5.5 hour flight) they are no more comfortable than economy plus. The seat 12D I was in was behind an economy plus seat. The light dimming for that directv screen was broken and the seat pitch was so bad even smaller women had trouble getting in and out. A true safety hazard. The padding was horrible and thin and the air vents were barely pushing air. The small of my back was sweaty due to horrible material of the seat and no ventilation. This seat only had one window because there was a blocked-out window. The bathroom in front was so small and the trash receptacle was horrible and overflowed. The underseat area was terrible and the way the power-plugs are arranged they are unusable due to being where someone's leg would be. The seat pitch is so bad if someone fully reclines you cannot get out of the seat. Thank goodness the aisle armrest was unlocked or I would be stuck in the seat. I think if there was a need for an emergency evac it would be a nightmare due to people being completely stuck. Shame on united for doing this. I spit on them and I have status with them due to my home city. I spit on united and its disgusting criminal deep vein thrombosis and unsafe plane seats. It is very restricted, if you have large shoulder, it is very bother some althoug it is economy plus. worse airplane experience ever. God willing some class action lawsuit will bankrupt this morally corrupt airline. First class seats are good on this plane, but I like the new ones better. The direct TV was a very nice entertainment for the short IAH-RSW leg. Food was OK, not as good as other flights. These seats had AC power located between seats below the armrests. It appeared that all the economy seats had power. This window seat was a nightmare. Bulkhead sticks out so I would have had to lean over if I didn't slouch underneath it. Worst part was the noise. Insane noise level! I could hear nothing the stewardess said about food or drinks two seats away. If I hadn't had noise-cancelling headphones and cotton shoved into my ear canals, I would have become ill. Very little recline in first class and no leg rest. Very uncomfortable for sleeping on a red eye. I manged to live with the no storage inder your seat but this seat is rock hard! Unacceptable for first class or economy. Completely inadequate cushioning and no lumbar support at all. You think you are getting more space in an exit row. Not! Stay away from the window seat. It is more narrow and your shoulder is right up against the bulkhead. Also the arm rest is foreshortened and useless. I am a small woman and my shoulders barely fit in this seat. Awful. Proximity to lavatory is bothersome, due to odor and people standing in aisles. Seat width feels particularly narrow and cramped on this configuration, particularly in middle. I just flew this aircraft two days ago and had a pleasant time, the seat was retrofitted to the new slimline seating and the window was not misaligned with the row. Proximity to lavatory makes this Economy Plus seat very unpleasant. Particularly given that the airline charges a premium for this seat. Row 20. What I did not expect is that the arm rests were fixed. I had a whole row to myself and plenty of legroom, but I couldn't stretch out and lie down because of a darn philips head screw that was holding the armrests down. This seemed strange because you'd think the designers would want those armrests to get out of way in an emergency exit row. the most uncomfortable seats i have ever had to sit in. no leg room, no under the seat room. no cushion support. should never be used for a flight longer than 20 minutes and i had a 7 hour flight to endure. i am 5ft 2 and 125 pounds. can not imagine how any one taller or heavier survived the ride without needing surgery afterword to fix their spine. this plane should be taken out of service. I dont agree with this seat being green/yellow. As mentioned the proximity of the bathroom is my gripe with this. Leg space is good and no obstructions with arms. The width is smaller since the arms dont come up. However the picture depicts it as slightly more off center than it is. Im staring at the bathroom entrance and it stinks. The exit door frame protrudes about 1.5" more into this seat than a standard window feame would, significantly reducing shoilder room. Very uncomfortable if seated next to a large person in the middle seat. Beware that the exit window seat cushions in row 21 have practically no padding and they become very uncomfortable after an hour. I heard that the regular cushion impedes access to the exit door (by a tiny margin), but the FAA made United change out the cushions. Bad seats - no recline (as mentioned) and non-moveable armrests. Not good for couples or families who like to raise the armrests when travelling together. There is very little room under seat to store anything. Not feeling the love in economy plus. United has jammed in an additional row of economy plus on this aircraft. It appears as though one or two of the economy plus rows are actually not larger than the standard rows. The additional row is labeled row 15. Row 15 is not on the seat map. The first class cabin and seating on the new 737-900 is most uncomfortable. I will avoid this aircraft whenever possible in the future! The configuration on this aircraft is ludicrous -- UA has reach a new low. All I could think was if they shipped livestock in this close a proximity it would be judged inhumane. And, indeed it was freezing. Never again. There is a heater vent on the floor that blows SUPER HOT AIR out on the wall near the floor of this seat. It was soooo hot for me the ENTIRE flight. AWFUL!!!!! The seats in the plane are VERY uncomfortable. My back, bottom and legs all hurt after about 4 hours.The seats are hard with not much padding There was NO entertainment on a six hour flight. The flight attendant told me that customers preferred using their personal devices, but you could not stream on the internet and the internet connection was spotty and slow in any case. It feels as if there is less legroom in economy plus than on previous versions of this plane. I had to ask the person in front of me to move up his seat back to I could retrieve my diet coke which I had put in the seat pouch in front of me. Decaf coffee is instant and bad (no more "we proudly serve Starbucks") I will happily avoid flying United in the future United led the way in charging customers for everything and gives you a LOT less for what you pay!! Seat cushion is half thickness, like sitting on a bench. Seat is narrower than D or E.
You have to pay for the internet even 1st class. NO VIDEO or AC plug. Nothing! Worst seat I've ever been in. No overhead storage for all of row 38. Seat width is ok, but space between rows is too tight to type comfortably on laptop. Can only recommend this seat if you don't have any carry-on luggage, and don't plan on using your laptop. I flew in this first class seat for 3 flights in one day. First time I've been claustrophobic in first class. When the seat in front of me was reclined at all, I couldn't stand up. It was just like sitting in coach, only with wider seats. I should have saved my money. First flight on a brand new aircraft, in BusinessFirst. Should have been a real treat, but instead may have been one of my last flights on United. The first class seats are very short, about six inches of my leg was past the edge of the seat and I'm only 6ft tall, so pretty average). The premium cabin is so packed, you cant access the aisle without the other passenger getting up, and you still bump the seat in front of you if they're reclined even a little bit. Its better than the super thin seats in economy plus, but not by much. and not worth the money. BRRRRR .... Flew in this seat both to and from PUJ via IAH. Bring a blanket. It was freezing both on the outward and return flights. Fortunately, I had friends in 1st class on the return who gave me their blanket! This particular seat provided me with adequate legroom and comfort. It is much more comfortable than the seats on the new A-320 series. I did purchase a snack with a price comparable to the airport shops. United takes a beating, but this flight, although fully packed, was comfortable and arrived on time. Crowded and uncomfortable. If you weren't smart enough to bring a snack you can buy their overprpiced ones. Direct TV is a neat idea. Charging for it is NOT. Same for Wi-Fi. United has become masters of nickel and dimeing the customer to death. How pathetic. There is a heater is the lower-side wall next to this seat. My legs were roasting for 5 hours on my cross-country flight! I would mark this seat yellow. Seat cushion is one-half of normal thickness due to proximity to exit window. Extraordinarily uncomfortable seat, one of the most painful I've ever flown on. Can't believe I am saying this but I would rather have a non-Economy Plus seat. United is moving towards total 737-800/900 (or a320) planes. Punitively uncomfortable. The crowding makes longer flights, e.g. Dulles to Los Angeles, extremely uncomfortable. Passengers are so crowded tension among passengers is almost unavoidable. I have flown United for decades but I am going to try other airlines. Really frustrated by this experience. Net net is pretty negative. Paying up for Economy plus seats in this model does give you great leg room, but the seats are so incredibly uncomfortable-- you can't recline in a way (and I'm not a big recliner) that is comfortable, nor sit up straight in a way that's comfortable. I experienced bad neck pain all throughout the flight (never happens) and my hips paid a big price in stiffness both on the flight and day after. All because the chairs are really not designed in a truly ergo positive fashion. I'm a 5'6" thin woman, so it shouldn't be too hard to make it comfortable. The chair padding is way too thin- you feel everything in the pocked from seat behind you and as reported, terrible lumbar support. Aisles are too narrow and you constantly get whacked by carts and passengers walking by. Seats too narrow to comfortably make use of armrest TV controls, and elbows constantly hit the one next to yours. 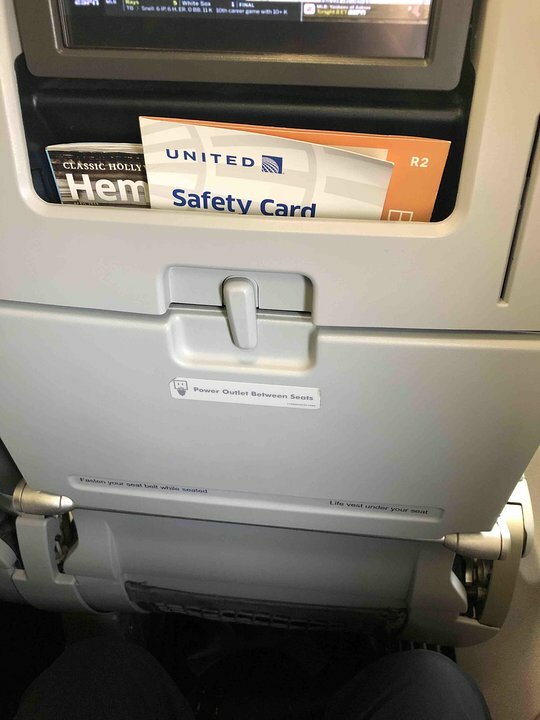 United really screwed up with these choices of seats. Made a long trip feel doubly so. Sad. I used to love Continental's configurations. Seat 30F has a vent on the floor which I quite liked, it was a good temp the whole flight. Seat cushions are hard, seats are narrow, seat pitch is terrible and near vertical. UAL in particular has become the veritable poster boy for wretched "service" and all manner of hidden fees. I used to be a Premier Executive with United and all I want to do now is extinguish my frequent flyer miles and dump that airline. I never thought I'd say this, but UAL makes Southwest look appealing. All aisle seats have about half the under seat space as normal, whereas the middle seats get extra under seat storage space. This is one of the worst planes I've ever been on (I've been on many and I'm including the puddle-jumpers.) This seems to be one of those planes where they added seats, both side-to-side, and back-to-front. Everything seemed fairly new so it seems this was recently done. The seats are narrower than standard planes, and with less leg room and under-seat storage as well. Average-sized people are crammed in like sardines. 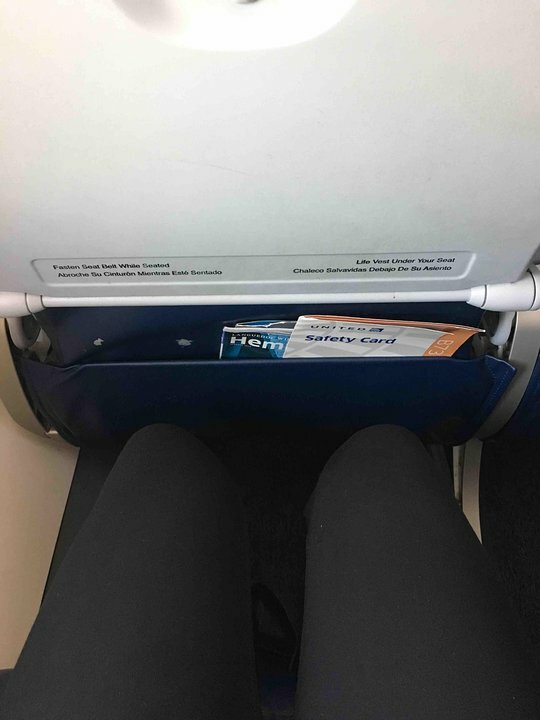 I am only 5'2" and about 110 lbs and I felt like I couldn't move at all; there wasn't even enough leg room for my short legs. I usually don't pay much attention to the plane models, but this configuration was so bad (and so obviously greed-induced due to how they've packed seats in) that in the future I'll be avoiding this model at all costs, no matter what the seat. Poor video selection for over water. Not bad over the mainland. Seat very uncomfortable for 4+ hours of flying. VERY noisy, even in First. This seat was actually more ucomfortable than 38A and the tall person behind me kept bumping the seat with her knees. The power outlets were hard to reach. PAYING individual entertainment screen at the seat. Doesn't make much sense to offer entertainment on a red eye but OK. The seat seemed to recline just as far as the other ones. The power outlets were hard to reach. No individual entertainment screen at the seat. Paid wifi available but unclear what the entertainment options would be. I avoid UA's 737's whenever possible but a switch put a 737-900V1 on the flight. Full flight and red-eye to boot. Jammed in place with "normal sized" folks in 25D,E - I'm 5-10,175. Awful hard bottom, hard on back, annoying Direct TV screen (turned off)- thankful flight was shorter than scheduled. Have tried Econ Plus in these A/C same dreadful seat. I would prefer 757 or A319-320 for seating preference. I doubt UA will put in the new Recaros in these 737's; but that would be a milestone of improvement IMHO. While this is a 737-900, it felt more like a 737-200 (outdated earlier 737, showing age, cramped). The 900 is supposed to be a stretched 737 with revamped lighting and a better cabin, but I had better times in southwest's 737-300s. I'm 5'11" and the seats are cramped very tightly, my knee almost touched the front seat (read: like a school bus) and the width of the seat seemed maybe an inch or two narrower than usual. All in all, the impression was that I was on an outdated 737 that United wasn't going to revamp and was probably in the process of either swapping or wearing it down as much as possible until the next C or D check. If you fly this 737-900, I would HIGHLY recommend upgrading to economy plus and get a window seat. The aisle seat gets bumped often since the entire airplane is crammed like sardines. Had this seat for the last three hours of a 20-hour trip from Japan, so I was already fried. I had enough room for a fully loaded Samsonite laptop backpack under the seat in front. Agree that the seat is very thin and has no lumbar support. When the lady behind me pressed her knees into the seat back, I got a little back massage-- it wasn't bad. The 3-inch recline is barely worth using. Biggest annoyance was the AV controls on both left and right armrests. I kept hitting them accidentally on both sides and changing the channels. Didn't matter much since I did not pop for the $7.99 charge to use it, and figured out how to disable the obnoxious repeating advertisements by turning the brightness all the way down. I didn't notice the adjustable sides of the head rest until I stood up to leave. For all that, the flight was okay, with good air pressure. Seat 11A does not have a window, but is a very comfortable seat. Seat 10A window is located slightly behind the center of the 10A seat cushion, so it is possible to look outside. I would like to reiterate information for seat 21A. This seat was more expensive than any other Economy Plus seat. This leads one to believe it is better than all others in every way. 21A, however, is little more than a jump seat. There is no padding in the seat and no padding whatsoever (let alone lumbar support) in the back. Additionally, the back is straight as a board with virtually no room to recline because of how close the passenger is behind you. Everything the passenger behind me put into their seatback pocket could be felt in my back. Literally, the seat is so thin, even the Hemisphere magazine poked into my back. And yes, it is correct that there is NO armrest on the left side of this seat. There is a 5-inch flat block on the exit door itself, but it is so far forward that that really isn't much of a rest either. The extra leg room is nice in this seat, but I promise your back will hurt by the time you land. This seat does have limited recline but it is the same as a car seat. The position when the seat is back is 100% comfortable. I think this seat needs a yellow/green! The 8C has an angle and location making flight attendant walking at you when passing the curtain between business and economy. The toilet door is very close to your right foot and people standing waiting are not aware of your legs and feets. I would have this seat marked as red in seatguru. 12A definitely is missing a window. If no one is behind you or they don't care, while the seat is reclined you will have a window right at your head, but in the upright position it is definitely a boring seat. Seat 30A has the heat vent, which serves the entire rear section, from the sidewall blow directly on it and cannot be turned off. The Stewardess called it "the hot seat." It was uncomfortable. The seat bottom in this seat has less cushion than normal. However, the exit door protrusion is very slight.